Add some color to your home with our kitchen backsplashes. At our flooring superstore, we not only offer outstanding flooring materials, we also sell and install stunning stone and marble backsplashes for your home or business. Visit our flooring store to browse our impressive collection of backsplash designs and materials. We love meeting new customers and being part of their renovation projects. A kitchen backsplash protects the wall behind a stove or sink from splashing water; but it is also a decorative element that transforms the appearance of an entire kitchen. No kitchen update or remodel is complete without a backsplash to tie it all together. If you have questions on backsplash installation or design, our experts can answer them all. With so many options and styles to choose from, we understand that making a decision can be overwhelming. We’ll help you navigate through all of the types, colors, and designs of our kitchen backsplash inventory so you’ll be happy with the choice you make. Backsplashes can be a striking addition to a kitchen. 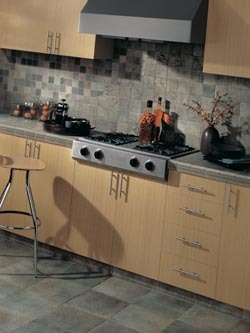 When carefully selected and professionally installed, a new backsplash makes a big impression on visitors and guests. Kitchens and bathrooms are the two rooms that have the biggest effect on the value of a home, so investing in your kitchen is an excellent idea if you’re thinking of selling. Furthermore, kitchen backsplashes are a highly visible feature that house hunters love. It’s a small investment, but choosing quality materials and professional installation demonstrate that you have looked after your home and invested in its long-term health. Whether you want to add a new ceramic backsplash to match your home’s current kitchen décor or you need beautiful stone backsplashes installed in your office building’s bathrooms, we have something for you. Choose from a large variety of tile backsplashes that are available at several price points, and don’t forget to arrange for our quick and easy backsplash installation services as well. We source our materials from the industry’s most respected manufacturers and work hard to bring you the best possible products at the lowest prices. Since we both supply and install tile, we cut out the middle man, which lets us lower our prices even more. You’ll save money every time you visit our store. Stone backsplashes can make your kitchen the focus of your entire home. These distinctive design features combine durability and beauty into one unbeatable package. When you walk into our flooring store, ask our friendly and knowledgeable sales team to give you a tour of our stone backsplash options. We have a number of choices for you to experience firsthand in our displays. High-end designers are using granite, marble, and slate to create exquisite kitchen backsplashes. These materials are both beautiful and functional. When properly sealed and installed, they are completely waterproof and resistant to stains, which makes them ideal for use behind a sink or stove. They also come in a huge range of colors, textures, and patterns, so your stone backsplash can match virtually any décor. Marble backsplashes are growing more and more popular among homeowners who care about style. We sell and install backsplash tiles made from the finest marble on the market, and we can help you match them perfectly to the existing marble tiles in your kitchen. Marble is a hard, solid material that holds up well under any circumstances, but it also features a timeless beauty that takes your breath away. Marble backsplash tiles are available in numerous colors and hues, with distinctive patterns that can be combined to create a unique look. Although marble is a luxury material, marble backsplashes don’t have to cost a fortune. We source fine marble from the nation’s top suppliers and negotiate low rates so that we can keep our prices down. You’ll be surprised at how affordable a marble backsplash can be. Looking for Affordable Backsplash Installation Services? Once you have decided on the best match for your home, lifestyle and remodeling budget, schedule an appointment for backsplash installation. Our highly trained installation team has a wealth of experience installing backsplashes in residential and commercial kitchens throughout the region. Since we know that your time is valuable, we work around your busy schedule when we install your tile backsplashes. We also make sure to lessen the impact on your family and minimize the amount of down-time required, so you can go on with life as normal in your kitchen. While working in your home, we go the extra mile to respect your privacy and minimize inconvenience. All the members of our backsplash installation team are friendly, professional, and respectful. We always leave our work sites neat, tidy, and safe and clean up after ourselves once our work is done. When we leave your home, you’ll have a beautiful new backsplash, and your kitchen will look its best. Contact our flooring company for more information about our kitchen backsplashes. We install marble and stone backsplashes for clients in St. Paul, Minneapolis, Maplewood, and Woodbury, Minnesota,, as well as the surrounding Twin Cities area.